Danny Ocean (Sinatra) gets together with his eleven buddies from World War II to put together a huge Vegas heist. After much work to assemble the crew (really a huge portion of the movie), the heist is pulled off. Then hilarity ensues following their discovery by a soon-to-be-stepfather of one of the crew. With three singers, Sinatra, Dean Martin, and Sammy Davis, Jr., there are even a few musical numbers thrown in. I'm not feeling like I have a lot to say about this movie. I saw it during my last week of school...I fell asleep and had to re-watch large chunks of it a few days later. So, while I did think it was a good movie, I'm not really feeling inspired to say much. So...three stars. And I would see this again due to the wonderful ending about which I will say nothing so that it can be a surprise for anyone who has not yet seen it. 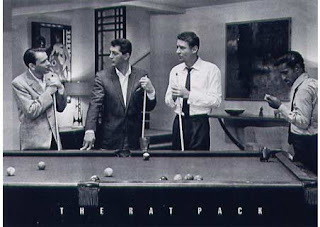 Labels: dean martin, frank sinatra, gambling, rat pack, sammy davis jr.